The Canadian Charter of Rights and Freedoms may only be thirty-five years old but it is an important document for all Canadians. Few today, however, are aware of the extensive work and tumultuous debates that occurred behind the scenes. 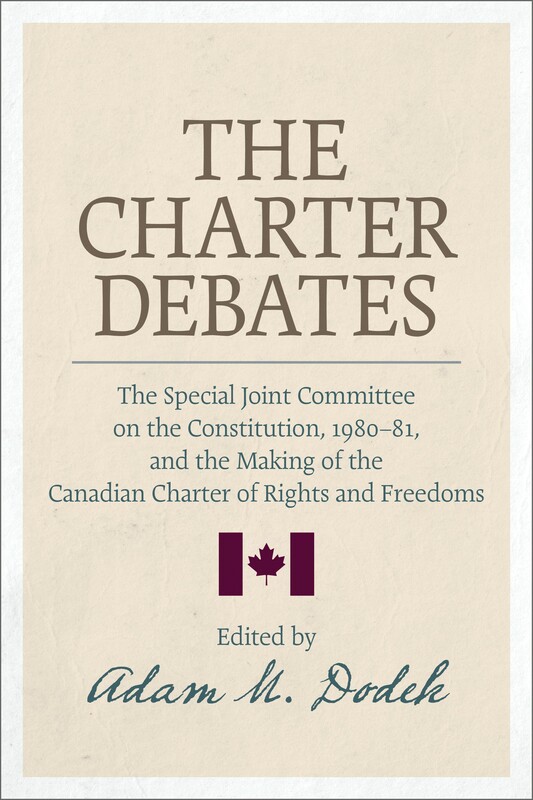 In The Charter Debates, Adam Dodek tells the story of the Special Joint Committee of the Senate and the House of Commons on the Constitution, whose members were instrumental in drafting the Charter. Dodek places the work of the Joint Committee against the backdrop of the decades-long process of patriation and takes the reader inside the committee room, giving them access to Cabinet discussions about constitutional reform. The volume offers a textual exploration of the edited proceedings concerning major Charter subjects such as fundamental freedoms, democratic rights, equality rights, language rights, and the limitations clause. Presenting key moments from the transcripts, carefully selected and contextualized, The Charter Debates is a one-of-a-kind resource for scholars, students, and general readers interested in the Charter and its impact on constitutional politics in Canada. Click here to visit the publisher’s website. Adam Dodek, Dean of the Common Law Section, teaches Public Law, Constitutional Law, Legal Ethics and Professional Responsibility, and a seminar on the Supreme Court of Canada. He is a founding member of the Faculty's Public Law Group, the director of The Professionalism Initiative and the co-founder of the Legal Writing Academy. He created and directs the Cavanagh Williams LLP Professionalism Speaker Series which is the first and only speaker series in Canada dedicated to issues of ethics and professionalism. He is the author of Solicitor-Client Privilege and The Canadian Constitution, as well as the co-editor of five other books. He is a member of the Chief Justice of Ontario’s Advisory Committee on Professionalism and is a former Governor of the Law Commission of Ontario. He is also a founding member of the Canadian Association for Legal Ethics and a member of the Advisory Board for the journal Legal Ethics. In 2014, he was named by Canadian Lawyer magazine as one of the twenty-five most influential figures in the Canadian legal profession. In 2015, the Law Society of Upper Canada awarded him its highest honour, the Law Society Medal, for his exceptional contributions to the legal profession. Click here to visit his Faculty web page.